With GNS3 Virtualbox edition, you can use simulate your whole network with servers, routers, firewalls, etc. so that you can see a bigger picture and thus will be able to better protect your network. One thing I will point out now is that the whole network might be impossible for a single person to simulate as it requires expertise in Networks, security, systems, applications, etc. If a person were able to simulate all these himself, then this blog might not be suited for him as his skill set is much beyond the average IT guy. In order to successfully deploy this simulation, you might require help from the network, security and even the system guys depending upon what you are not an expert in. There are resources on the Internet for configuring all of these like using a Virtual-machine on virtualbox, etc. In this topology, I have simulated a secure Enterprise network having multiple routers, Firewall and Server. The Server has been placed in the DMZ and a user has been placed in the Inside zone. 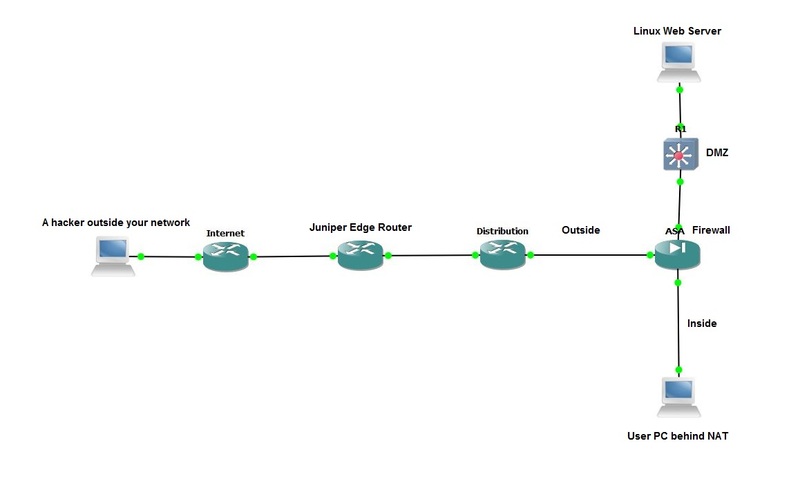 The outside interface of the Firewall has been connected to the distribution router which leads towards the exit via the Juniper edge router. I am using different components in the network so that the vulnerability of each can be assessed. The Internet has been simulated via a single router behind which the Linux system meant for the Hacker is placed. You can try your own combination of Operating Systems and network topology. 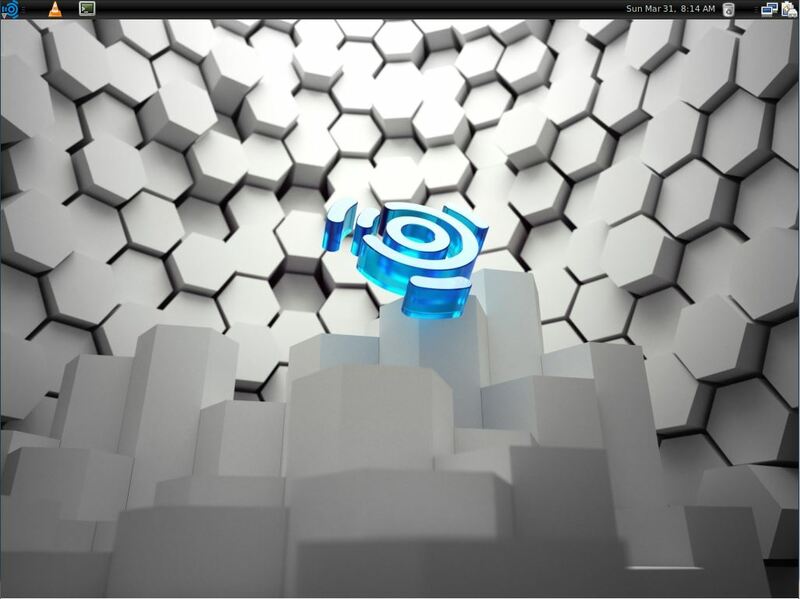 There are also several network components like IDS and IPS which a GNS3 can simulate but I don’t have an expertise in. If you can set it up or get it set up by someone, it will be good for simulating a diverse environment. The Linux Web server can be assessed for the vulnerabilities in the Apache system and exploits used on it. You can also add DNS, SMTP and POP services to the Linux server if you want to assess the vulnerabilities of these services as well. In place of a Linux box, you can simulate a Windows server which can be called a Hackers favourite food. On this you can run a website with SQL and exploit its vulnerabilities. The user system is a Windows XP PC which can be used to assess the threats an internal host can pose. A Firewall has been used to see the effects of perimeter security on the Internal networks. The interaction between the untrusted outside network, the server-hosting DMZ zone and the end user hosts can be easily assessed. A Juniper Router and a Cisco Router has been used because the 2 devices can then be assessed for the various vulnerabilities associated with them. 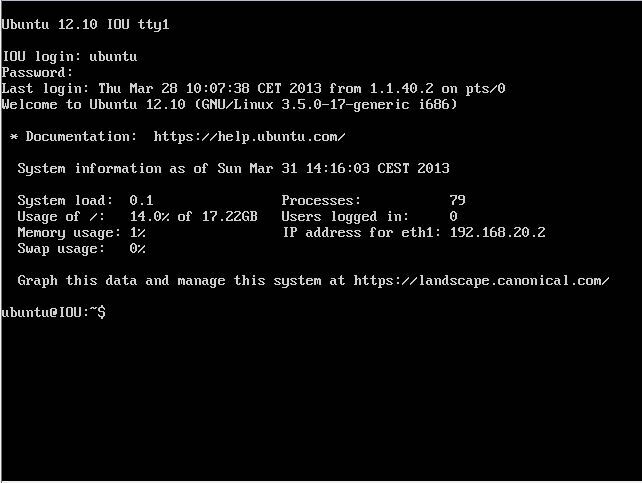 A graphical Linux Host has been used as a Hacker terminal so as to use the various graphical Pen test tools like Nessus, etc. Metasploit is one of the other very good tool for Pen Testing. Folks preparing for CEH or already are in the field would be knowing better tools then I have mentioned. As I have already said, with GNS3 Virtualbox edition, the possibilities are endless and it is only limited by imagination. These are the few ways I could imagine utilising such a network for Ethical Hacking training or for testing. 1) Launch DOS attacks on the DMZ server via a flood of traffic or TCP open session attack. 2) Attacks based on spoofed source addresses. 3) Attacks on the various vulnerabilities present in Windows system. 6) DNS server can be attacked to modify the A and MX records and to redirect traffic for man in the middle attack. 7) SMTP server can be attacked to make it a potential Spam server. 8) End hosts can be compromised to launch a DDOS attack. 9) Effects of worm infection on the User PCs can be checked and its effects on the network and the networking equipments can be assessed. 10) The threat from Internal employee can be assessed who is launching attacks from the inside. These are the few ways I can imagine how a simulated network like this can be used for training or testing. Those in the Ethical Hacking domain can get even more uses of such a network as they can imagine better than me. This entry was posted in CEH and tagged CEH, Certified Ethical Hacking, exploits, Firewall, gns3, Linux, Pen Testing, practice, simulate, Testing, Training, Virtual Machine, virtualbox, Vulnerabilities, Windows by samirsogay. Bookmark the permalink. I downloaded asa.ios.rar and set up all required preferences in gns3 correctly — I hope. My host is Win7 and it has worked with many VirtualBox arrangements previously. When I try an ASA, the console comes up and it says “Uncompressing Linux ….. OK booting the kernel” and it stops there — no further output from the ASA console. Any ideas?? Running ASA has nothing to do with Virtualbox, it is run on QEMU. I am myself running on Win7 and it is working fine. Hope this blog helps from where I have setup.